Zinc is one of the important minerals required by the human body. It is required for several physiological processes, responsible for growth and maintenance of the body and helps in the efficient functioning of our immune system. It is usually prescribed as a supplement to young kids who frequently suffer from cold, cough and ear infections. It is also prescribed to people suffering from diabetes, high blood pressure, rheumatoid arthritis, ADHD and asthma. The typical symptoms of zinc deficiency include frequent colds, coughs, hair fall, dry skin, loss of appetite and slow wound healing. Zinc is an “essential trace element” and is required in very small amounts. The recommended dietary allowance for zinc is 11 mg for men and 8 mg for women per day. Here’s a list of plant-based sources of zinc I have compiled from IFCT-2017 tables. 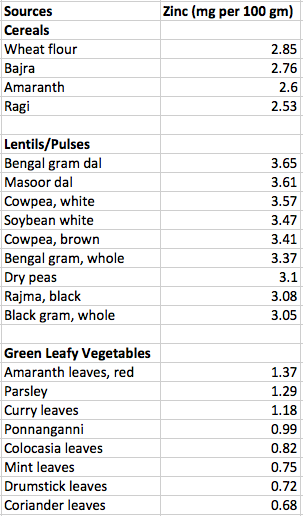 1) Most of the lentils that are commonly used in Indian cuisine have adequate amounts of zinc. When taken with cereals like wheat, bajra and ragi, it is possible to meet the daily requirement. 2) Although fruits and vegetables don’t have enough zinc, the green leafy ones such as amaranth, mint and curry leaves provide sufficient quantity of zinc, along with various other vitamins and minerals. 3) The common spices used in Indian cooking such as ajwain, cumin, coriander and fenugreek seeds are high in zinc. It is better to use fresh, whole spices rather than store-bought spice powders. Many of us have switched to plain boiled vegetables without any spices. This is due to the wrong belief that spice powders increase acidity. Excess use of red chillies could be the issue here and it doesn’t make sense to avoid the other spices that possess healing properties. 4) Sesame seeds / Gingelly seeds top the list for zinc as well (along with calcium and iron). Toasted sesame seeds can be added to vegetables, parathas and salads. My favourite way to eat sesame seeds is of course, the molagapodi ;-) Cashews and flaxseeds are also rich in zinc and can be easily incorporated into our daily diet.